It’s easy to lose hope after you have experienced significant tooth loss — but there’s good news. No matter how many teeth you are missing, it is totally possible to regain your beautiful smile and stable bite with implant dentures. This option offers a permanent solution for significant tooth loss. Keep reading to learn more about how dental implants work, who they are right for, and how implant dentures can end up saving you money in the long run. Implant dentures are a set of prosthetic teeth held in place with dental implants, or tiny posts that have been implanted beneath your gum line. Dental implants are made of titanium, a sturdy material which promotes the growth of bone tissue to fully integrate with the mouth. Over the course of several months, the dental implant posts gradually fuse together with the jaw bone. Thanks to this process (known as “osseointegration”), dental implants offer far more security than conventional dentures, which rest directly on the gums. Who Are Implant Dentures For? Dental implant-retained dentures are a good option for anyone who has experienced extensive tooth loss but is in generally good oral and overall health. Patients who smoke heavily or who have health conditions affecting the immune system may be better suited for a non-implant retained replacement option. In patients who have lost significant bone tissue due to advanced periodontal disease or because of the missing teeth, a preliminary bone graft can help to create the proper environment for a successful dental implant procedure. Implant dentures which replace an entire arch of teeth in the upper or lower jaw are removable for cleaning and regular maintenance. Partial implant dentures, on the other hand, can be fixed or removable, depending on your preference and specific oral health needs. Fixed and removable dentures both look natural and promote a balanced, nutritious diet. Dental implants cost more than other methods of replacement, but they are well worth the investment in a stable, long-lasting smile. A denture that is supported by dental implants will require fewer replacements over a lifetime compared to a conventional denture. That means you will likely end up saving money in the long-run on adjustments and re-fittings. There is no fixed price for an implant denture, so do not hesitate to get in touch with us to discuss your tooth replacement and what you can expect to pay. Dental insurance, if you have it, can help you save on certain aspects of the treatment. If you are struggling with the loss of several teeth, don’t worry that you will have to spend the rest of your life with a loose or ill-fitting denture. 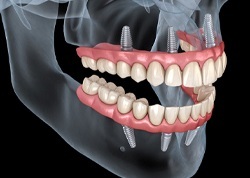 A stable tooth replacement can be achieved with dental implants! We invite you to get in touch with Juno Beach Smiles to discuss your options this month. Ruthye was dealing with a problem many of our patients experience: her denture was moving around in her mouth and causing her pain. Her ultimate fear was that her teeth would literally fly out of her mouth and land in someone’s lap while she was speaking! Dr. Keuning was able to place just two dental implants to not only stabilize the denture, but give Ruthye a better looking smile as well (as confirmed by her husband and daughter). She says that despite being a very involved procedure, she didn’t feel pain at any point, and now she’s smiling more than ever.